L-R: Eric Swanson, James Fujimoto, and Robert Huber. Thanks to this team, doctors can now look at living tissue in new ways to diagnose eye disease, cancer, and other serious illnesses faster and more accurately. At a ceremony held today in Venice, Italy, the European Patent Office (EPO) honored U.S. 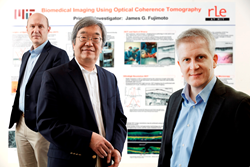 Engineers James G. Fujimoto and Eric A. Swanson, and German Physicist Robert Huber with the 2017 European Inventor Award for their development of Optical Coherence Tomography (OCT). The team was distinguished in the "Non-EPO countries" category – one of five categories of the annual award. Held at the Arsenale di Venezia, the awards ceremony was attended by some 600 guests from the areas of politics, business, intellectual property, science and academia. EPO President Benoît Battistelli, together with Carlo Calenda, Italy’s Minister of Economic Development, opened the ceremony. OCT works on a principle similar to ultrasound, except that it measures the "echo" time delay of light beams instead of sound waves. Launched in 1993 as a clinical prototype, OCT revolutionized the standard of care in ophthalmology and was welcomed as a transformative medical technology. The multidisciplinary team’s invention, for which they filed more than 50 patents during development, has also had a major economic impact. "Today the [OCT] market is approaching a billion dollars per year. There are over 16,000 high-quality jobs and it's saved billions of dollars in unnecessary healthcare expenditure," said Eric Swanson. With the help of patents, numerous European companies, such as Carl Zeiss, Heidelberg Engineering and Michelson Diagnostics have commercialized OCT technology and become major players in the industry. The inventors continue to advance OCT. Fujimoto trains a new generation of OCT engineers as principal investigators in the Research Laboratory of Electronics (RLE) and Department of Electrical Engineering and Computer Science at the Massachusetts Institute of Technology (MIT). Fellow MIT alumnus and business partner Swanson serves in technical roles at OCT companies, while Huber is creating ultra-fast lasers as a professor at the University of Lübeck's Institute for Biomedical Optics. 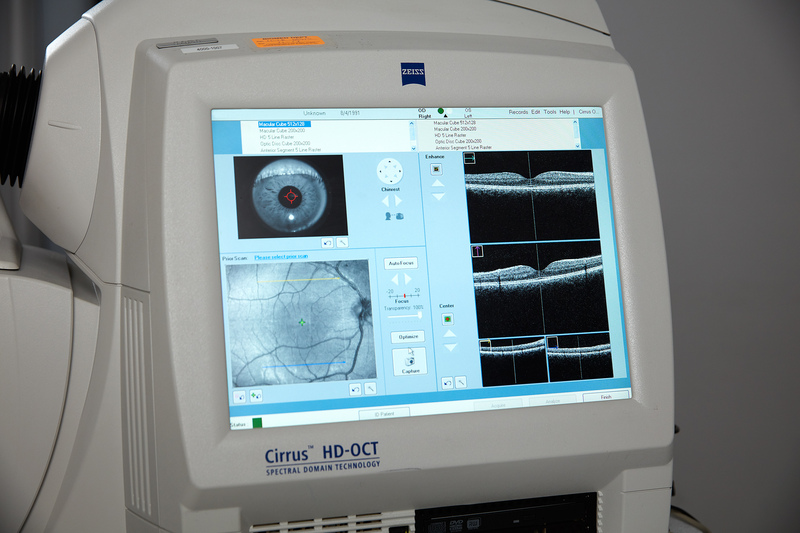 What originally started as a diagnostic tool for eye diseases – with about 30 million scans now performed worldwide every year – has since brought high-resolution to several other medical fields, including cardiology, endoscopy, surgical guidance and dermatology, with over 50,000 systems installed worldwide. OCT's transformative impact is even more significant considering that none of the three award-winning inventors are medical professionals. "I am not a doctor, I am not on the front line of helping people. But even as an engineer it is possible to do things that have a positive impact," said James Fujimoto. − Broadcast-quality (HD) videos of Fujimoto, Swanson and Huber. − Print-quality photos from the award ceremony in Venice (available from 11.30 CET onwards). − Licensed and cost-free audio-visual material of the ceremony and winners available in HD and SD quality starting at 15.30 CET. − More information about all 15 European Inventor Award finalists (including AV, photo and text materials) is available in the EPO Media Center. − To watch the ceremony live or on demand, visit the EPO website or use the "Innovation TV" Smart TV app of the European Patent Office.